We are now under 5 weeks until the season gets underway. 34 days from today, if you want specifics. This week, Statistically Speaking previews the new Pac-12. In a bit of irony, 5 conferences are changing league membership this season, but the Pac-12 (formerly Pac-10) is is the only one to undergo a name change to match. For last season's Pac-10 projections, follow this link. The Cal Bears were one of the more unbalanced teams in the nation in 2010. The Bears ended the season with the worst offense in the Pac-10 and the best defense. The difference between their offensive SDPI (-1.37) and their defensive SDPI (1.46) was quite high, at 2.83 standard deviations. On its own, this number seems very large, but as a standard of comparison, I looked at all of my current SDPI ratings for the six seasons from 2005-2010 to see where it would place overall. It still placed quite high, at 13th overall. The table below lists Cal and the 12 teams in that aforementioned span that had larger differences between their offensive and defensive SDPI ratings. The table also lists their offensive, defensive, and total SDPI, as well as their ranking in those categories in their respective conferences that season. To see how these teams typically performed, their conference and overall record are included as well. 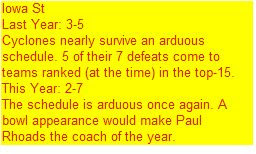 While Cal had the misfortune of suffering a losing season, some of these unbalanced teams were actually quite successful. The most unbalanced team on this list, Houston in 2009, won their division and BCS heavyweights Auburn (2007) and Oklahoma (2006) played in big bowls (Chick-Fil-A for Auburn and the Fiesta for Oklahoma). However, as one might expect, on the whole these teams were about average in terms of their final record. Their cumulative league record is 50-54 and their cumulative overall record in 80-82. For the most part, being very good on one side of the ball and very bad on the other, usually portends overall mediocrity. Last time we previewed the Big 10, which now has 12 teams, and this week we take a look at what the coming season may have in store for the Big 12, which now has 10 teams. Give the Big 12 credit, they will crown a true champion in 2011, as their conference schedule now consists of 9 games, meaning it is a true round-robin format. Enjoy the Big 12 while you can because we'll probably be seeing another seismic realignment shift in the college football landscape very soon. 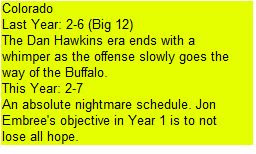 To check out last year's Big 12 projections, follow this link. For anyone who follows college football closely, what I am about to type is as obvious as Jim Tressel's culpability: Robert Griffin means a whole lot to Baylor. For those who may not know, Robert Griffin is the fleet-footed Baylor quarterback, who last season helped lead the Bears to their first bowl game since 1994, and first ever season of at least a .500 record in Big 12 play. While Griffin did play for the Bears in 2009, he was injured in the season's third game and did not take a snap during conference play. Without him, the Bears endured through a typical Baylor season, finishing 1-7 versus the conference, with just one loss coming by fewer than single digits. The Bears relative emergence in the Big 12 in 2010 was entirely a result of their offensive improvement under Griffin. 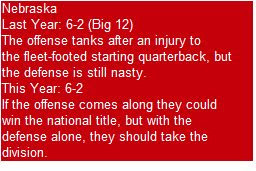 The defense ranked 11th in SDPI in the Big 12 in 2009 and a marginally better 10th in 2010. However, the offense improved from 10th in the Big 12 in SDPI in 2009 to 2nd in 2010 with Griffin at the controls. 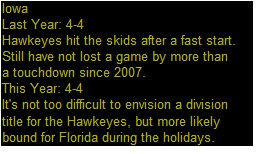 Instead of merely focusing on SDPI, I wanted to look at how much more often Baylor scored in 2010. While yards (the measure of SDPI) are a key contributing factor to points, scoring touchdowns is focus of every offense. With that in mind, take a look at the following table which lists offensive touchdowns for Big 12 teams in conference play in 2009 and 2010. Baylor ranked dead last in the Big 12 in 2009, scoring just 11 offensive touchdowns in 8 conference games. In 2010, they improved their offensive output by an amazing 23 touchdowns (nearly 3 additional offensive touchdowns per game). One man made the difference between the basement and mediocrity. We are just a shade over 6 weeks until kickoff of the 2011 college football season. Our next stop on the preseason preview train is the midwest, and the Big 10, a conference that will host its first ever championship game this December. Before you read this year's preview, check out last year's Big 10 preview. Casual college football fans likely don't know who Vic Koenning is, and why should they? Koenning was a failure in his brief stint as a head man, winning just 5 games in 3 seasons at Wyoming. However, since returning to coordinator duties, Koenning has consistently elicited fine showings from his defenses. 2010 was no exception as Illinois posted the third best defense in the Big 10. The table below lists the defensive SDPI of each of the last 6 defenses Koenning has coached, as well as their defensive rank in the their respective conferences. Koenning took over as defensive coordinator at Clemson in 2005 and within one season had the Tigers at or near the top of the defensive pecking order. He joined Bill Snyder's staff at Kansas State in 2009, and while the defense was below average, the Wildcats still improved dramatically as they were dead last in the Big 12 in defense in 2008 (-1.82 defensive SDPI). He then joined the Illini staff in 2010 and coaxed a fine showing from a defense that had finished 9th in the 11 team Big 10 the previous year (-0.75 defensive SDPI). So it's clear Koenning has a track record of producing solid to outstanding defensive performances, but how much did he improve the fortunes of Kansas State and Illinois in 2009 and 2010 respectively? Since their defenses were so bad in 2008 and 2009, it's likely they would have improved regardless of who was coaching up the defense. To answer this question, I first looked at all BCS conference defenses between 2005 and 2009 that produced a defensive SDPI of between -1.50 and -2.00 (that is one and a half to two standard deviations below average). These defenses were comparable to Kansas State in 2008. 17 BCS conference defenses (not including Kansas State in 2008) in that 5-year period met those criteria. Of those 17 teams, 15 improved the next season. The average improvement was nearly an entire standard deviation (+0.95). 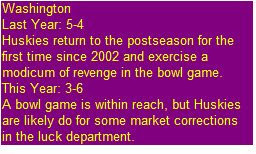 The table below summarizes the results and compares them to Kansas State's improvement from 2008 to 2009. 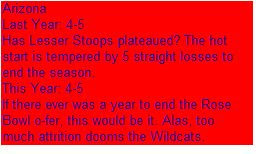 The average defense that posted numbers as bad as those of Kansas State improved by about one standard deviation the following season. Kansas State improved by 1.45 standard deviations. Only four other defenses with comparable SDPIs saw better improvement. 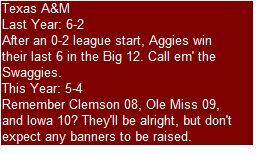 For the curious, they were in order of improvement, Nebraska 2007-2008, Cincinnati 2005-2006, Florida State 2009-2010, and Texas A&M 2009-2010. Alright, so Koenning likely helped improve Kansas State by a more significant margin than we would have expected of an 'average' defensive coordinator. What about Illinois? 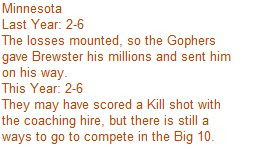 The Illini posted a defensive SDPI of -0.75 in 2009, so the situation was not nearly as dire as the one Koenning inherited in Manhattan. To compare how similar defenses fared the following season, I looked at all BCS conference defenses between 2005 and 2009 that produced a defensive SDPI of between -0.50 and -1.00. 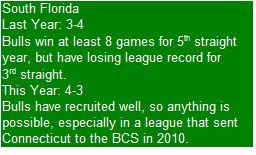 45 BCS conference defenses (not including Illinois in 2009) in that 5-year period met those criteria. Of those 45 teams, 31 improved the next season. The average improvement was a little more than a third of a standard deviation (+0.37). The table below summarizes the results and compares them to Illinois' improvement from 2009 to 2010. Once again, Koenning and his defense beat the average, this time by an even healthier margin. Illinois improved by nearly a whole standard deviation more than the average of the 45 comparable teams. Only eight other defenses with comparable SDPIs saw better improvement, with Wisconsin from 2005-2006 leading the way. I guess what I was trying to get at here in this piece is that Vic Koenning is one of the better defensive coordinators in the game today. 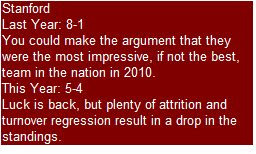 I fully expect Illinois to remain in the upper-echelon of Big 10 defenses in 2011 and beyond (should he remain in Champaign). While he may not have the necessary skills to be a head coach, he appears to be someone who is quite capable of coaching up a defense. We have crossed the 50 day threshold. Exactly seven weeks, or 49 days, is all that separates us from for real football. 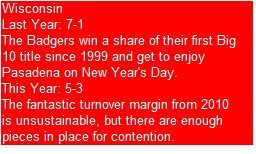 Today, Statistically Speaking tells you how the Big East will shake out in 2011. 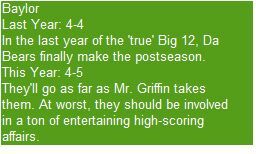 To decide how much you want to trust these projections, here's the link to last year's Big East preview. In his relatively brief head coaching career, Skip Holtz has been pretty successful. He boasts a career record 46-32, had had just a single losing season (his first at East Carolina in 2005), and has won a pair of conference titles. However, Skippy, like his father, has certainly not been flashy in his winning ways. 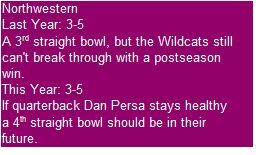 His East Carolina teams also posed significant problems to my projection system as they frequently finished with sterling won/loss records in Conference USA despite mediocre SDPI numbers. The table below illustrates those discrepancies. As you can see, with the exception of his final year at East Carolina, when his Pirates rated out as the second best team in the league, his teams have usually ranked around the middle in terms of performance. However, Skip always seems to get the best out of his teams. One was he has done this is by posting a phenomenal record in close games. Since 2006, teams coached by Skip Holtz have gone 13-7 in one-score conference games and 22-11 in one-score games overall. How have his teams been able to post this strong record in close games? One reason may of course be randomness and small sample size, but there is one statistical category where his teams have consistently performed well--blocking kicks. His teams have blocked 18 kicks over the past five seasons. Perhaps more importantly, those blocked kicks have aided the cause greatly in close games. 11 of the 18 blocks have occurred in 9 one-score games since 2006. His teams' record in those 9 games? 8-1. Drop those 9 games from the ledger and his teams have gone a more 'normal' 14-10 in one-score games since 2006. The system did not project South Florida to win the Big East this season, but it wouldn't shock me if the Bulls steal a BCS bid despite an underwhelming statistical profile.